When the trainer has him & is training him he doesn't train him all day just a short time of the day,the dog needs to go hunting & find some birds not just think he's training for a short timr. I personaly think the huntem up command is hooey,when you turn the dog loose he should hunt with out any command,the dog just needs some real hunting experience. To me he has been over trained & is bored with the training.NEEDS HUNTED & BIRDS KILLED FOR HIM!! how do I have them do that post in different place. I was new to this this am and I couldnt go any place on the site til just now. also thats what I thought I thought if you are a hunting dog you should want to go not head for the truck. my friends have dogs that cost way less then mine and their dogs are ready to go when they see you grab a gun. I agree. Sounds like knows exactly how long Hunt Test times are and needs long walks with wild birds. If you seen him hunt on you tube and he did well, then its not the dog its you. Spend some time with the trainer, learn how he works the dog and go from there. They don't come with a owners guide and it can be different from one trainer to another. Just my opinion and a thought to try and help you enjoy your dog. No trained dog needs or benifits from wing on a string and nearly all experienced hunting dogs know the difference in "fake" and "real " I think if you keep pushing him with the collar you could ruin him. It sounds like you just started confusing him. Get with the trainer and learn how to work him before its too late! Is he heading to the truck after you give him a correction? i saw this 2 years ago with young GSP pup.he was scared of me and ran way out from owner. my lab when tired runs to truck also to go home. The dog is new to you and is probably a little unsure of itself and what it is you want from him. That can cause the dog to look for a safe place(his crate). The dog almost certainly was trained in short sessions because that is how folks with ten or twenty dogs to train HAVE to do it. The dog is probably used to sitting on a tie out , or chain gang, watching the other dogs until it is their turn. As far as exercise, it is likely that the dog was harnessed to a roading bar on a four wheeler with three to seven(or more) other dogs and run for a half hour ever second or third day. Again, when you have a whole bunch of dogs to exercise, this is how you have to do it. Last year I gave my son a five/six year old bird dog. This dog had been trained and conditioned from the time it was a puppy, to run in front of a horse for an hour. He is/was a big running shooting dog/borderline all age so he can really pick them up and lay them down. He was also conditioned to hunt at more modest ranges when hunting, but still flat out, full tilt from start to finish. His hunting stints were typically on the order of an hour or so long, usually as part of a brace. He was a hard charger that was trained and encouraged to put it all out there for an hour at a time becasue that is how long most major stakes are. My son took him hunting, by himself and the first few times, after two to three hours, my son said the dog started coming back in, which was very untypical. When he was whistled on, my son said it was almost as if the dog was confused and obviously tired. My son was in track in high school and now runs occasionally in middle distance( 5 and 10K) runs, so he can walk forever. After a half dozen or so of those four to six hour hunts, the dog learned to dial it down and now hunts at a slightly less aggressive pace for several hours at a clip. Give your dog some time and some positive reinforcement. It has a lot of changes to wrap its head around. A call to the breeder/trainer to ask how the dog was trained and exercised couldn't hurt. They might have some suggestions and insight for you as well. 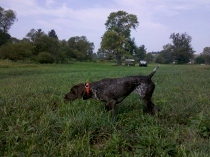 traumagnet wrote: We my family purchased a GSP that was supposed to be already trained. ..............like the breeder said to do. After 2 weeks we started with his basics whoa, wing on string, fetch and started giving him his hunting command of hunt em up. A Started dog that you needed to start with puppy training ? RayGubernat wrote: A call to the breeder/trainer to ask how the dog was trained and exercised couldn't hurt. They might have some suggestions and insight for you as well. Very correct --- and once you have their answers, find a new trainer or get on a proven training program and do it yourself. I was pm'd over this dog & from what I'm hearing now I don't believe this dog has been socialised beyond that one training field.The dog is uncomfortable any where else he goes. The breeder has offered to replace the dog with a new pup but wants the op to pay for the training when he has already payed for a broke dog. This is probably a situation that is not going to turn out well & cause this first time Bird dog owner to mistrust all breeders & trainers & that's a shame. Just a little after thought,I also think this is one of the dogs that never had much of a chance to be a puppy & have some fun.I believe he probably had too much obedience & pressure at TOO YOUNG of age. I agree and that's a shame. Everyone wants a Master Hunter/ FC when they are 10 months old whereas it used to be the dog didn't get pressured until after 10 months. Heck I'm really old school,I don't expect much or put pressure on them until they tell me when it is right,I've had dogs broke as early as 14 months and as late as 3 years.I give them the first hunting season to be tough enough to buck bad luck,Rank bold pups that knock and chase don't give me heartburn,I know it's part of the game and they will see the error of their ways on their own.Whoa ain't for around birds,and obediance squelches the fire,I like to throw gas on that fire and make em love it,We got one here now that the switch just flipped on,he runs around and is having fun and is finding birds,pointing them and actually allows for flushing attempts.He nailed a point 150 yards out on sunday,I walked over,flushed and killed for him.Sent him on afterwards and he tore off like a rocketsled on rails,found him on tree with another bird up in the limbs 15 feet.It flushed from the tree and we didn't shoot at it,he chased,came back rooted around some more,casted off again and was found on point near a small pond,that bird was on the otherside of the water,waded acrossed the calf high water,kicked the bush and shot a rooster for the dog,he hit the water like a lab,collected up his spoils of war and we were done for the day,the dog knows his name,kennel,here,and bring it.He is 15 months old and has little preseason monkey buisness with planted birds,We've taken him out twice preseason,he pointed and I killed. Cascade_fisher wrote: I agree and that's a shame. Everyone wants a Master Hunter/ FC when they are 10 months old whereas it used to be the dog didn't get pressured until after 10 months. lot dont enjoy woods and dog because of this. Vonzeppelinkennels wrote: I was pm'd over this dog & from what I'm hearing now I don't believe this dog has been socialised beyond that one training field.The dog is uncomfortable any where else he goes. PS Only had one bad experience with a trainer in Michigan. He had the dog for 6 weeks for FF. Called me and said it was too hot to do much so needed the dog for 4 more weeks. Enter me-fool/sucker When I picked the dog up , the trainer showed me that he would hold the dowel for a minute. I'd try maybe going the field parking the truck and taking a book. Sit in a chair or on the tailgate and ignore the dog (or seem to). Let them get bold qnd start looking around and sniffing. Often the dog will open up a bit if they think you are not watching. Plant 1 or two quail around then pretty much ignore what he does around it. If you get solid points then flush them for the dog no talking and NO GUN. see what becomes of the desire to hunt away from the truck. If this boldens up try walking with pup away from the truck just taking a walk. 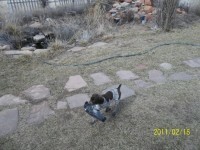 Dont put birds out until pup is feelng pretty confident and again NO GUN yet..
Wow! That's a real shame. I think I'd simply ask for my money back and be done with this trainer. How would you know that another pup would be any different? Not long ago there was a thread on this page or another on this forum wondering when you should start training and how long you should let a pup be a pup. Well, a pup is always a pup, and as for training, you are training from day one even if all you're getting is a house dog. The Intensity of training and the rate of learning will be set by the pup. It's just up to the trainer to be able to read this. In other words, they need to be smarter than the pup. I also think a training regimen should include time for plenty of play, fun and socialization. Play is a sign of intelligence, and pups do more of it than anything other than sleep. As the philosopher Friedrich Nietsche said, "There is nothing more serious than a child at play." You could easily include pups in that description. Another suggestion might be to go to a preserve and have a half dozen or eight...or even more... pheasants or chuckar stocked over a fifty acre or bigger field. Spread 'em out so ther dog has to hunt far and wide for them. Cut the dog loose and start killing birds for it. Betcha it won't want to head for the truck if there is fresh bird scent out there. If the dog breaks on a bird or chases or whatever...let it go...don't correct the dog...you can fix any of that later. Just let the dog find birds and get its gums wrapped around them after you shoot. mountaindogs wrote: I'd try maybe going the field parking the truck and taking a book. Sit in a chair or on the tailgate and ignore the dog (or seem to). Let them get bold qnd start looking around and sniffing. Often the dog will open up a bit if they think you are not watching. Plant 1 or two quail around then pretty much ignore what he does around it. If you get solid points then flush them for the dog no talking and NO GUN. see what becomes of the desire to hunt away from the truck. If this boldens up try walking with pup away from the truck just taking a walk. Dont put birds out until pup is feelng pretty confident and again NO GUN yet.. Thought about this thread all day and came back to look at it again. Don't know how I overlooked your post mountaindogs, but nearly the same idea occurred to me just after lunch. Vonzeppelin informed us that the dog is uncomfortable in new places, so the idea is to help the dog get comfortable. Yes, take a chair and a book. I'd also take a water bowl, jug of water, the dog's favorite toy if it has one, and a bone or something for the dog to chew (great for stress relief). Drive somewhere where you can park the truck in or right beside a nice patch of grass. Set up the chair, put down the water bowl, get the dog out, and then just play with it. Right there beside the truck. When the dog seems to want to take a break, put some water in the bowl for it and let it drink. Give it the bone or whatever you brought for it to chew and sit in your chair and read. If the dog wants to lay right beside your chair or at your feet, that's fine! As long as it seems relaxed and comfortable. If it begins to seem anxious or nervous then OK, this session is over. Load the dog up and go home. Do not scold it. Next time out drive to a different place and do the same thing. You want to get the dog to associate new places with having fun! This will also build it's confidence which will allow its natural curiosity to come into play, and make the dog want to explore its surrounding a little bit more. This is, of course, predicated on the OP still having the same dog, and it's going to take some time. But with dogs, just like kids, time is the most precious thing you can give them. I use "ok" for a release command but some people I know use "hunt em up". I agree encouraging a dog to hunt is hooey. But, a release command is not nor is a command used to tell the dog to tell the dog to quit dawdling and move on. Good advise for what limited info we have. hunting and go back to a truck. I'd more expect to have to drag the dog back to the truck. It does seem it MAY be a case of being kennel blind. I think I'd try just taking him for VERY long walks so he can't quit and go back. Perhaps as he becomes a accustomed to you and his new lifestyle, the problem will resolve itself. I can tell you one thing, and that's that I wouldn't invest any more money with that breeder. Last edited by gonehuntin' on Mon Nov 04, 2013 11:42 am, edited 1 time in total. traumagnet wrote: Well he hunted em up for about 2 mins and then started running back to the house. I called the breeder/ trainer up he said get a collar so we did. What kind of collar? An E-collar!!?? Could be I'm missing something here, but am very curious to know how any kind of "collar" could/would enhance a dogs' prey drive, or desire to get on birds. traumagnet wrote: He then would hunt them up for about 30 min then wanted to go back to the truck and load up. Vonzeppelinkennels wrote: Just a little after thought,I also think this is one of the dogs that never had much of a chance to be a puppy & have some fun.I believe he probably had too much obedience & pressure at TOO YOUNG of age.